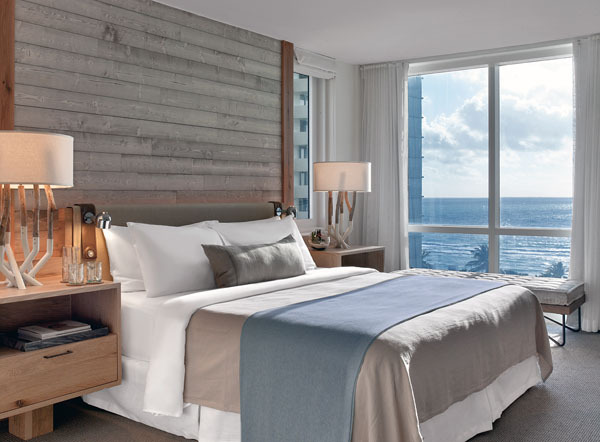 People don’t typically think about visiting Miami for a relaxing getaway, but now you can come to Miami, stay at the most beautiful hotel and enjoy everything the magic city has to offer—while also experiencing a wellness vacation. 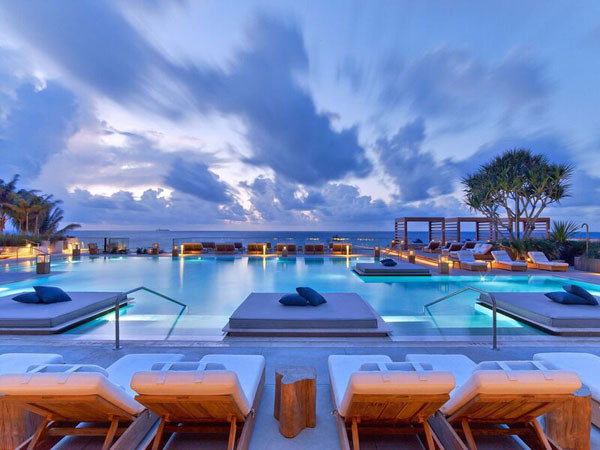 1 Hotel South Beach is the ultimate spot to take in some sun at the beach and lounge by the pool—yet still be able to work out, eat healthy, and unwind with unparalleled holistic spa treatments. Visit alone, with friends, or spend time with family while immersing in the ultimate wellness retreat. 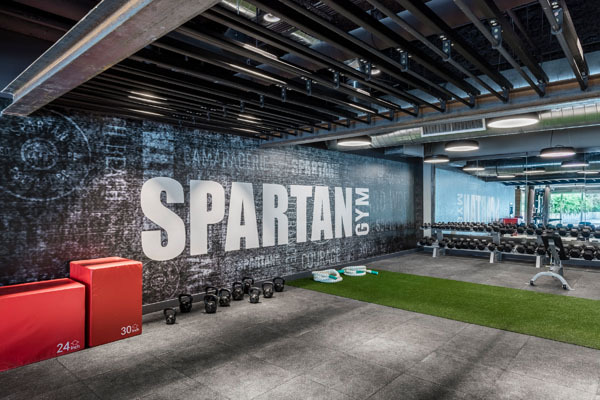 1 Hotel South Beach has the first-ever Spartan Gym. Guests can train in a studio complete with ropes, obstacles, and direct access to local Certified Spartan trainers dedicated to helping those with all fitness levels. Test your limits through Spartan private training sessions or dedicated classes including Spartan Obstacle Conditioning, Ripped, Sunset Core Flow on the yoga deck and a variety of specialized kids classes. 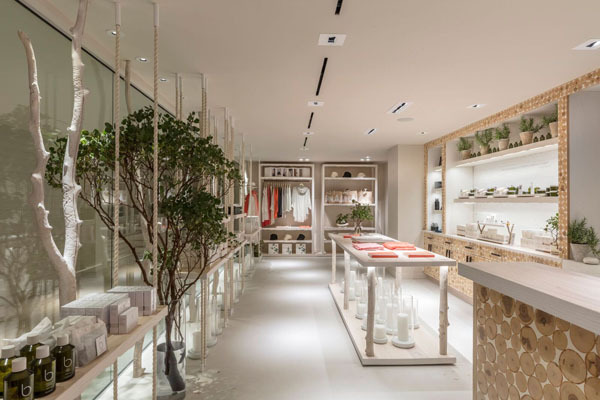 British lifestyle and wellness brand, Bamford, officially opened its first-ever Haybarn Spa in the U.S. at 1 Hotel South Beach. The spa welcomes visitors into a serene, 4,500 square-foot space with natural accents and a holistic take on relaxation. Helmed by company founder and organic pioneer, Carole Bamford, the spa’s natural and sustainable philosophy mirrors the 1 Hotels’ brand mission to provide a unique experience to relax and escape. Enjoy tailored treatments including the Himalayan Salt Stone massage, After Sun Recovery body wrap and a nourishing Skin Collagen Gel Mask. James Beard Award-Nominated Chef Matthew Kenney celebrates vegetables in their best form in his newly debuted restaurant Plnthouse. The culinary team has crafted a menu of whole, healthful, and delicious plant-based items that complement the environmentally-conscious, luxe 1 Hotel South Beach lifestyle. Open for breakfast through early dinner, guests can maintain their diets by grabbing vegan or vegetarian wraps, salads, smoothies and bowls. Noting the importance of holistic wellness, 1 Hotel encourages guests to strengthen their minds, bodies and souls with group fitness programming. Offering complimentary yoga, Vinyasa flow, Pilates and meditation classes, each session is skillfully curated and tailored towards tranquility. 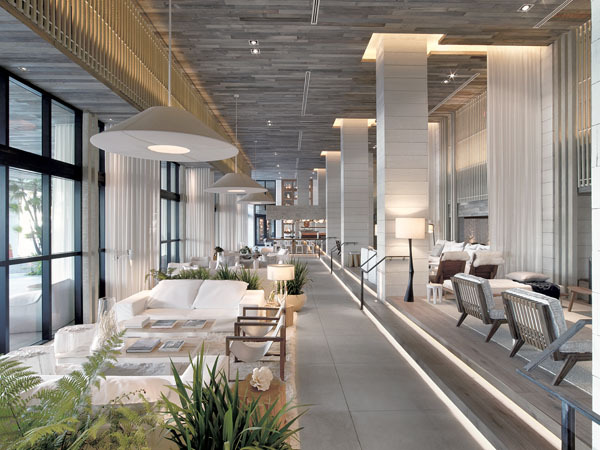 Nativ Made offers food fit for a busy lifestyle with its grab-and-go concept located in the lobby of 1 Hotel South Beach. Made with organic, local ingredients, its signature salads, delicious pastries, cold-pressed juices, healthy snacks and fair-trade coffee and are all made with standards of edible integrity. 1 Hotel South Beach offers the country’s premier full-body indoor cycling studio. Featuring a 2,600 sq. ft., 54-bike studio, its indoor cycling workouts incorporate weights and core exercises into 45-minute classes. Designed for fat burning and strength training, guests can lose themselves in the music, energy and mind/body experience. 1 Hotel South Beach has it all. There’s never a need to leave, and if so – a Tesla house car is waiting curbside. My experience began as I walked through the doors and saw a live wall of moss which turned into artwork. I was truly amazed at all of the live plants which hung gracefully from the ceiling that was colored with breathtaking orchids. Everywhere you look there was life surrounding guests of the hotel. 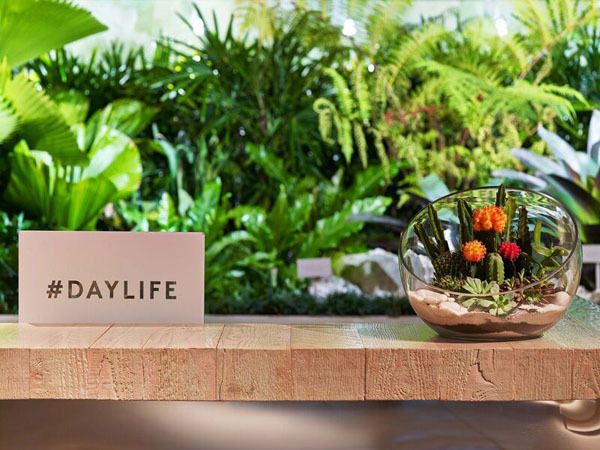 Succulent plants in glass bowls adorned the light wood tables in the lobby. I was greeted by a peaceful gentleman named Dilip Mukundan who is the director of Sales & Marketing at this truly amazing hotel. As we started our tour, Dilip started to explain the 1 Hotel’s concept of being eco-friendly to a level I could never have imagined. As we made our way through the lobby, there was a fruit stand offering fresh fruit sourced from local farmers for guests to enjoy. Even the halls were lined by repurposed pine wood that was salvaged from trees that were unfortunately infested by a species of beetles. The color was a gorgeous hue that resulted from a natural chemical reaction from the beetles. Light colored natural fabrics, woods, and stone gave the room an inviting and calm essence. Everything is recycled in the hotel, including the cardboard clothing hangers in the rooms. Want to write a note, you will not find a pad or pen, but instead a small chalkboard with chalk on your bedside table. Even the tap water in the room is drinkable due to a triple-filtration faucet. The room was luxurious and designed for comfort with natural elements including the hemp-blend mattress. After seeing the suite, we visited the Bamford Haybarn Spa where natural elements and wafting soothing aromas created a calming and inviting feel. Adjacent to the spa was a state of the art gym that follows the Spartan concept. Just outside the gym is the amazing plant based restaurant called plnthouse helmed by chef Matthew Kenney. From juicing to smoothies, their dishes are deeply rooted in nature with a nod to the importance of health and fitness. My favorite dish that Dilip recommended for breakfast was the Garbanzo scrambled. The flavors were so palatable as the fresh herbs delighted the taste buds with a slightly spicy kick. The Zen like pool area offers breathtaking views of the ocean and makes you feel like one with nature. According to the CEO, “I wanted to capture the beauty of nature in a hotel, and in doing so commit to safeguarding it as best I can, a responsibility that I believe we all share. It’s 1 world.” They have planted the seeds to aspire to live an eco-friendlier life and give back to the environment as the same time. I cannot thank Dilip and his team enough for this relaxing and health inspiring return to nature that I experienced at the 1 Hotel. All of the restaurants and amenities were at the highest level and the hanging orchids made me smile every time I walked past them. It’s amazing how the hotel has kept true to this concept and created this spectacular eco-friendly getaway in the heart of South Beach. This is one not to miss!